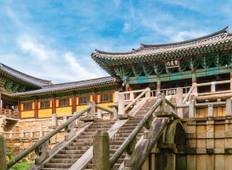 Find a Discovery trip that explores South Korea. There are 11 tours to choose from, that range in length from 3 days up to 10 days. The most popular month for these tours is October, which has the most tour departures. "Tour covered many aspects of Korean History and included places which you might not..."
"Everything was great except for some of the meals which we were not accustomed to...."